I’ve been playing around with using multiple cameras to capture my classroom this semester. 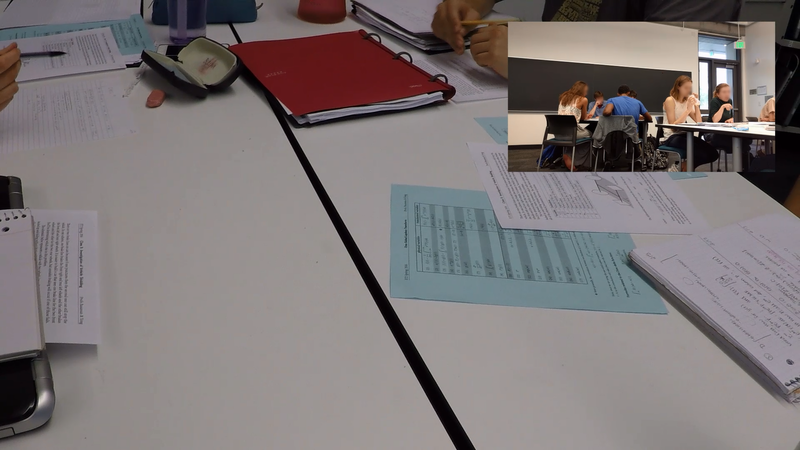 I’m using more than one camera so that I can capture what’s happening in the class as a whole and also what’s happening as I interact with different groups of students. I want to be able to capture video from my point of view for several reasons: (1) I want to record (approximately) what I was seeing and noticing so as to help uncover the signals that led me to decide to intervene with a particular group of students or not; (2) I want to record the kinds of questions that students are asking and how I responded to them–is there something that I could have said that would have helped them more? (3) I want to be able to capture the way students and I talk to each other–what did I position myself relative to them (crouching down, or bending down to talk to them) and did it make any difference in their body language or response to me? Here’s a sample still from a produced video. You can see four students sitting together in a group of four. (Ideally, you would be able to clearly make out what is on their paper.) In the corner is a wide-angle view of several groups. 2) GoPro Hero4 Silver mounted on my chest with a Sony ECMCS3 microphone. Good points: both cameras capture at full HD (1920×1080) resolution, and the microphones are by and large capturing important conversations. The video is giving me lots of things to look at. However, I’ve been plagued by lots of (mostly technical) problems. I have been trying for weeks but I still haven’t found a good method for capturing the video reliably. GoPro on my chest is mounted in such a way that if I bend down to talk to students, then I just get a shot of the floor or table. I need to constantly remember that I have to position my torso so I get a good view of students’ work and faces. Swivl camera is pretty horrible because it needs line of sight to track you because it uses IR. It has a remote control that I wear on a lanyard that it uses to track where I move so it should theoretically always have me in the shot, but I’m not in the shot half the time. The only solution I’ve found so far is to stick it up higher above students and have it tilted down slightly. Audio quality is also pretty bad from the Swivl camera. Watching the footage from the GoPro makes me nauseous. I am using ffmpeg vidstab to stabilize the video, but it takes hours to process the footage. Adobe Premiere Pro has a really steep learning curve. If I have to watch another video to figure out how to do something (that I think should be) simple I am going to scream! I’m also behind one version (CS6 instead of CC) and this older version doesn’t have the nifty feature of aligning two clips of video automatically based on the audio tracks. I am encoding the finished video using H.264. However, if I set the encoding compression too low, the video ends up being huge (15GB). If I set the encoding compression too high, then I can’t make out what is on students’ papers. Both cameras use exFAT file system, so videos get chopped up into smaller files to avoid 4GB file size limit. That also adds more complications to video processing. On my Nexus 5X, I think it skips a few seconds of video when it transitions from one file to another while recording. I look pretty ridiculous wearing all this equipment. This is a work-in-progress post. I hope to have more technical issues sorted out soon.